Wander around the atmospheric Holy Rude graveyard and you will see headstones which are hundreds of years old. The earliest dates from 1579. Many show the trade symbols and tools of trade of the person who is buried there. The rugged rock which rises South of the Valley is The Ladies' Rock. This was a favourite vantage point for the ladies of the court to watch the Royal Tournaments in the Valley and the Kings Park. From here, you can enjoy panoramic views across to the Trossachs and Ben Lomond. The valley has been the place of execution of witches. In the valley cemetery you will see a Victorian monument which commemorates the Wigtown Martyrs, two women who were drowned in 1685 for refusing to renounce their protestant faith. The Star Pyramid commemorates all who were martyred while seeking religious freedom. 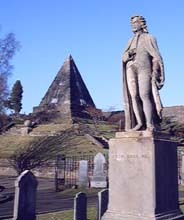 The £1.7 million project to restore Stirling’s Old Town Cemeteries was recently completed. Work on the project involved bringing the physical infrastructure of the cemetery back to the original Victorian style, with restoration of stonework, ironwork, and, hard and soft landscaping. The Cemetery interpretation project has been developed to include still photographs, a series of documentary films on the restoration of the Cemetery itself and a dedicated website. The Old Town Cemeteries together with Stirling Castle, Argyll’s Lodging and The Old Town Jail make up a world-class experience for visitors. It’s hoped that the restoration project will further enhance the Top of the Town visitor experience, bringing more visitors to the area for longer, generating additional spend for local businesses. The project received funding of £824,000 from the Heritage Lottery Fund, £430,226 from Stirling Council, £376,126 from Historic Scotland, and £18,183 for a specific piece of work to Pithy Mary Pond from Scottish Natural Heritage.